I have 2 posts today... if you are looking for my SCRS Sponsorship post, please scroll down. Thank you! Hello! It's time for a brand new Mojo Monday sketch (#242). Teresa has a great sketch for us this week! I was in need of a sympathy card, and this is what I came up with. I used Forever in Our Hearts (which is on sale now!). Accessories: Labels Eight Nestabilities (Spellbinders), Die-namics Mini Royal Rose (My Favorite Things), Lace, Pearls, Foam tape, Thread, Sewing machine. 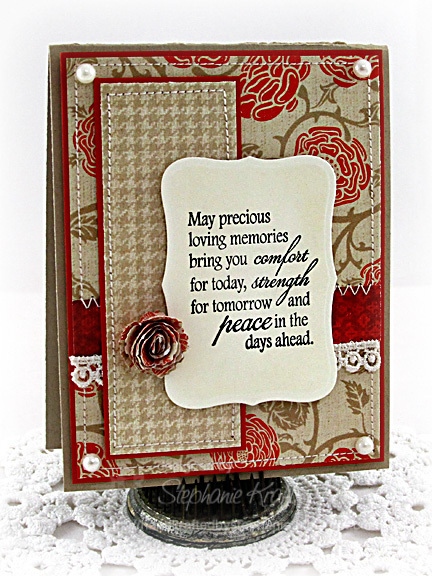 What a beautiful sympathy card. I think I am going to CASE it as I will be needing one very soon. This is gorgeous! Love the kraft/red combo! So pretty Stephanie! Love the rolled rose and the sweet sentiment! Thanks for the inspiration! Gorgeous sympathy card Steph! LOVE the papers and the sentiment you used! Simply gorgeous! The colors are beautiful and peaceful for such an occasion...you pulled it off really well.